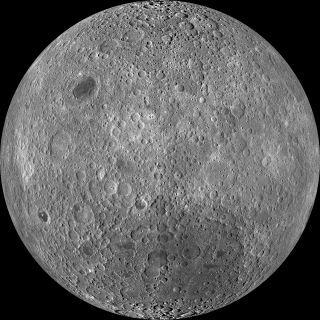 The far side of the moon, often mistakenly called the "dark side" though it receives just as much sunlight as the near side, as imaged by NASA's Lunar Reconnaissance Orbiter. Sunday's rare "supermoon" total lunar eclipse has prompted greater discussion of the moon — and those discussions sometimes involve persistent lunar myths. Some of these myths are simple misconceptions, such as the notion that the moon is perfectly round (it's not), or that it lacks gravity (all celestial bodies exert some gravitational force). Other myths are more conspiracy-oriented, such as the idea that the Apollo moon landings were faked. Sunday's supermoon eclipse is the last of the current lunar tetrad, a series of four lunar eclipses that have occurred over the last 18 months. Some people have regarded the tetrad as a sign of the end of the world. This dubious claim was made in a recent book about four "blood moons," a term rarely used by astronomers. While eclipse tetrads are rare, they have taken place in the past, and will continue to occur in the future. A previous tetrad occurred in 2003 and 2004, and such groupings will occur seven more times in the current century. "Throughout human history, people have always thought that things in the sky that they didn't understand were either signs of apocalypse or good luck, or the gods were angry or pleased," Noble said. "Lunar tetrads are simply the result of orbital dynamics and geometry — no need to invoke the supernatural or the end of the world." I've actually had arguments — er, enthusiastic discussions — with people regarding whether or not the moon moves closer to the Earth as it rises, making it appear larger than normal. While the moon does vary in distance from the Earth during its month-long orbit, the differences aren't significant during a single trek across the sky. Rather, the reason the moon looks larger near the horizon is due to an optical effect known as the Ponzo illusion. "The human mind judges an object's size based on its background," Noble said. "We think of things on the horizon as being further away from us, so our brains fool us into thinking the moon must be bigger." The moon's orbit is slightly elliptical, so its distance from Earth varies from approximately 222,000 miles (357,000 kilometers) to 252,000 miles (406,000 km) over the course of a month. During the lunar eclipse this weekend, the moon will be at perigee, the closest point to Earth, at which point Noble said it appears about 14 percent bigger and up to 30 percent brighter than the moon at its most distant. As the moon orbits Earth, it keeps one face perpetually turned toward the planet. This fact has prompted some to refer to the distant lunar hemisphere as the "dark side" of the moon, as popularized by a 1973 Pink Floyd album of the same name. However, this label is false, because during the new-moon phase, when the surface pointed toward Earth is all but unseen, the "dark" hemisphere is pointed toward the sun. While lunar "back side" is acceptable, "far side" is the preferred term among scientists, said Sarah Noble, who served as program scientist for NASA's Lunar Atmosphere and Dust Environment Explorer (LADEE) mission, which ended in April 2014 when the orbiter intentionally crashed into the surface of the moon. Several missions have orbited the moon and provided a great deal of information about the far side. Most recently, NASA'S Lunar Reconnaissance Orbiter (LRO) has obtained imagery and topography of the entire moon, including the far side. "We know quite a lot about the lunar far side," Noble told Space.com by email. Freewheeling astronauts on the moon may give observers the idea that Earth's companion has no gravity, but that would be false. Everything with mass has gravity, and the strength of an object's gravitational field is determined by its mass. The moon is much less massive than Earth; the Apollo astronauts who explored its surface experienced gravity just 17 percent as strong as that of their home planet. Smaller objects, such as asteroids and Mars' tiny moons Phobos and Deimos, have much weaker gravity still. "You wouldn't really land on them; it would be more like docking with them," Noble said of these bantam bodies. Explorers would have to anchor to them, or hover nearby. Many people claim to see "the man in the moon" on the lunar surface. On the near side, lava flowed from volcanoes that were active from one to four billion years ago into craters and basins created by impacts, forming dark regions called "mare." "Because of a psychological phenomenon called pareidolia, humans tend to interpret patters as familiar things, particularly faces, so we see the man in the moon," Noble said. "Houston: Among the large headlines concerning Apollo this morning, there's one asking that you watch for a lovely girl with a big rabbit. An ancient legend says a beautiful Chinese girl called Chango-o has been living there for 4,000 years. It seems she was banished to the moon because she stole the pill of immortality from her husband. You might also look for her companion, a large Chinese rabbit, who is easy to spot since he is always standing on his hind feet in the shade of a cinnamon tree. The name of the rabbit is not reported. Michael Collins: OK. We'll keep a close eye out for the bunny girl." Noble said the most common myth she is asked about is the idea that the Apollo missions never landed on the moon. Naysayers claim that the necessary technology did not exist to make such a trip possible in the late 1960s and early 1970s. Noble said she normally responds to these claims by pointing to her research looking at the rocks and soils returned by the Apollo astronauts, and how they differ from terrestrial rocks. But modern lunar missions have helped to provide further evidence for the historic missions. "Another great response is the images from LRO that actually show the footprints and flags we left behind," Noble said. Editor's note: If you snap an amazing photo of Sunday's supermoon lunar eclipse and want to share it with Space.com, send images and comments in to managing editor Tariq Malik at spacephotos@space.com.